It seems that President Obama is also a fan of the CFD Vision 2030 Study as it is cited in the Whitehouse’s recent announcement of the executive order creating the National Strategic Computing Initiative, a research program intended to push U.S. HPC into the exaflops and exabytes realm. GrabCAD does a good job of describing up and coming discrete geometry (aka 3D printing) file formats: AMF vs. 3DF. Sample computation from Beta CAE’s new Epilysis FEA solver. Image from ENGINEERING.com. See link below. MSC Apex Diamond Python [wow] was released and includes advances in mid-surface modeling. Beta CAE System included a new FEA solver, Eπilysis [ωοω], in release 16 of their software suite. OpenVSP 3.2.0, the open source parametric aircraft geometry tool, was released. Feature detection (mesh to surfaces and features) is coming in the next release of Polygonica as we see from this article in DEVELOP3D. Updated versions of MicroCFD are now available. Kitware shares information about Computational Model Builder, their framework for end-to-end simulation support including preprocessing. Part of a nuclear reactor mesh generated using components of Kitware’s CMB. Image from Kitware. See link above. NAFEMS is offering a 1-day seminar on A Guide to Hybrid RANS-LES Methods: Industrial Examples and Theory. The seminar will be held on 23 September 2015 in Oxfordshire, UK. Kitware seeks your images and videos created with ParaView for display in their booth at SC15 this November in Austin. Presentations are now being accepted (and are due by 15 September) for UM15, the North American modeFRONTIER Users’ Meeting 2015. This event will be held on 05 November in Novi, Michigan. Intelligent Light is sponsoring Aerospace Fluid Science Summer School for graduate students on 02-04 August at Yugawara, Kanagawa-ken in Japan. Keynote speakers from Cummins, Caterpillar, and General Motors have been announced for the CONVERGE 2015 Users Conference. 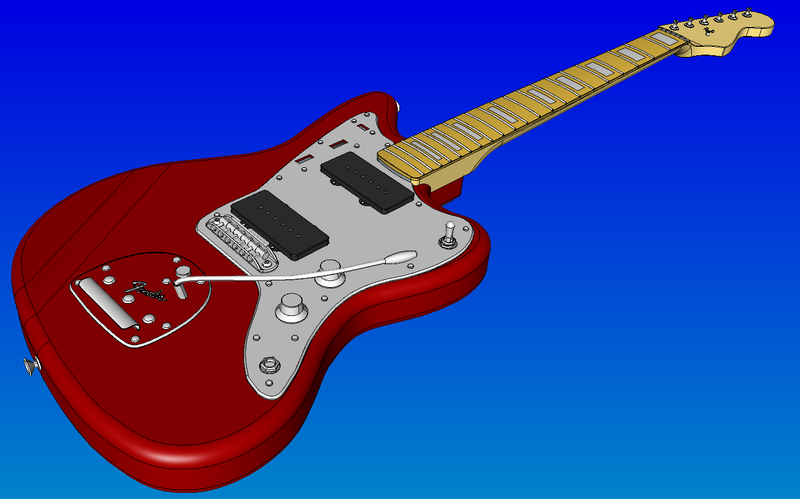 Guitar body geometry displayed in Pointwise for the 23rd International Meshing Roundtable meshing contest. The contest geometries for the 23rd International Meshing Roundtable (12-14 October, in Austin, Texas) have been announced: a guitar body and an abdominal atlas. Entry deadline is 30 September. All the details can be found on the Meshing Contest page. 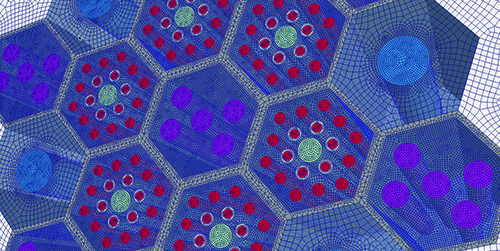 Pointwise’s Zach Davis will present VSP to CFD with Pointwise Part II at the OpenVSP Workshop 2015 on 11-13 August. What If Your Mesh Came to Life? When it comes to abstract painting, not every horizontal line is a horizon and not every vertical line is a person. But it seems to me that every triangle, square, tet, or hex is a mesh. Because that’s the first thing I thought of when I saw 1024 architecture‘s video The Walking Cube. Screen capture of 1024 architecture’s video The Walking Cube. Click image for video. In fact, I find the video oddly nightmarish – a Frankensteinian hex mesh cell come to life, awkward yet menacing. Is this what happens to cells inside mesh generation software when they’re being generated and stretched and skewed and sized to our specifications? It looks tortuous. Maybe this hex has escaped the mesh to seek vengeance for how it has suffered. Or maybe I just need a good night’s sleep. This entry was posted in Events, Hardware, News, Software and tagged Apex, Beta CAE, CONVERGE CFD, Intelligent Light, Kitware, meshing, MicroCFD, modeFrontier, MSC, NAFEMS, NSCI, OpenVSP, ParaView, Pointwise, Polygonica, SC15. Bookmark the permalink.